I have never put them in one place like that, so it was kind of interesting to see how many I have and how it all looks. 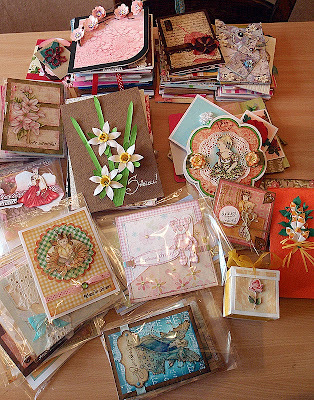 I'm gonna bring also some of my decoupage works and see how it goes. I will share this news also in Sassy Cheryl's Blog Show Me#44. 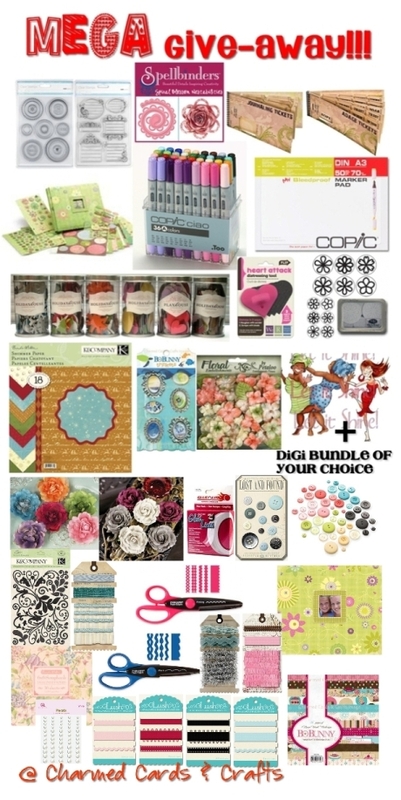 Who could think that it is possible to get this huge crafting supplies for free??? 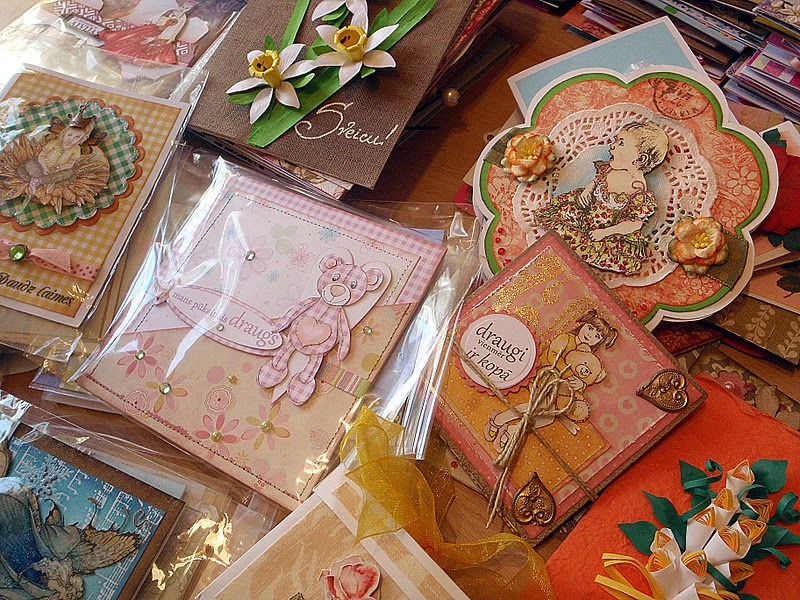 Well yes, just go to the Charmed Cards And Crafts and see what they are giving away! Our first challenge posts will go live next Thursday October, 6th so stay tuned for that! 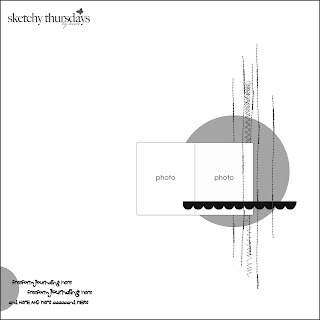 This layout is the first one I have ever made using official Aleksa's kindergarten photos. This one is from last year and on her photo sheet this pic was with the most shy smile. And that is an unusual thing, because she usually tends to pose with especially wide or silly smiles. Next I layered lots of different laces. 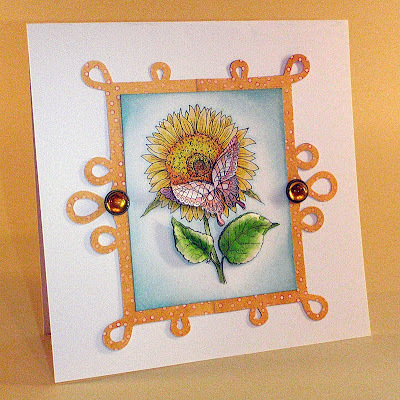 First one is plastic lace I used in this card. Then I took some fabric lacy edge and also regular lace and sprayed them with diluted Butterscotch Color Wash - they actually don't look so yellow, but rather creamy in real life. Last layer was paper panel I punched with my Fiskars scalloped daisy punch and sprayed with Butterscotch and leftover self-made acrylic paint spray I made for On The Sea Side layout. 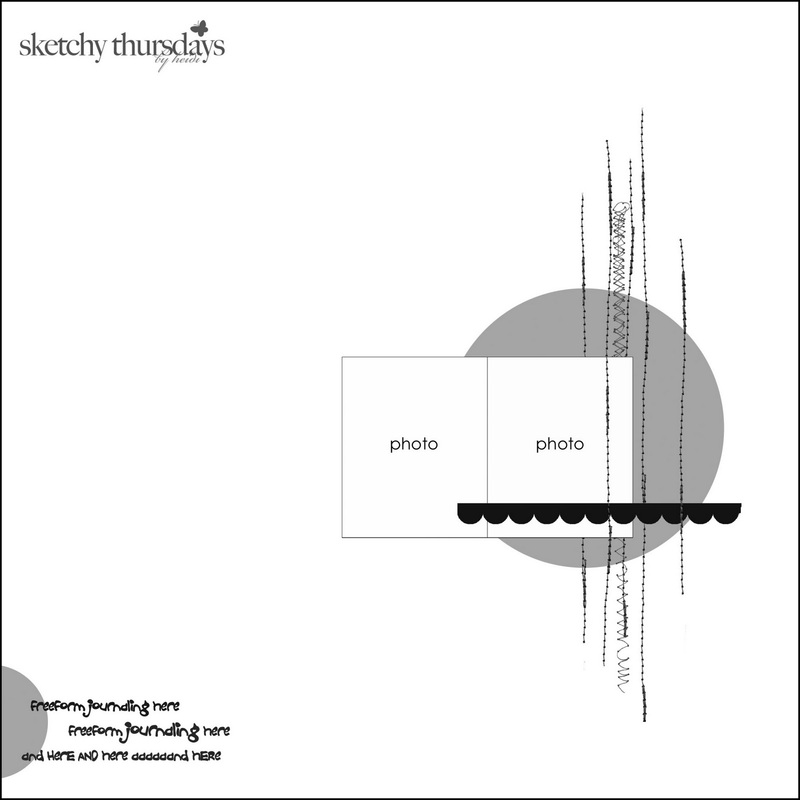 As I use Once Upon A Sketch in this layout, there was a journalling criteria - journal on photo. So I grabbed my white Gelly Roll pen and wrote on Aleksa's photo about how many different smiles she has. Bottom layer of my flower cluster is made out of same fabric lace edge, just arranged as flower rosette. I topped it with another fabric flower, metallic flower, some paper flowers and red jewel brad. This flower cluster is made similar and complimented with metallic butterfly. It's time for Color Combos Galore color palette and Sketchy Thursdays sketch. 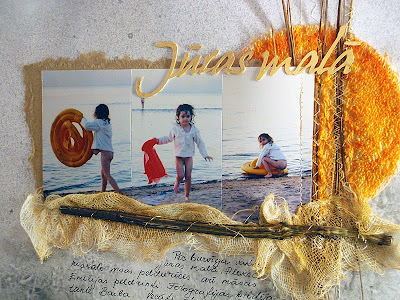 As most usually I start with photos and this time I chose three small photos of Aleksa on beach - her float-able swimming tools matches so good with that sketch. 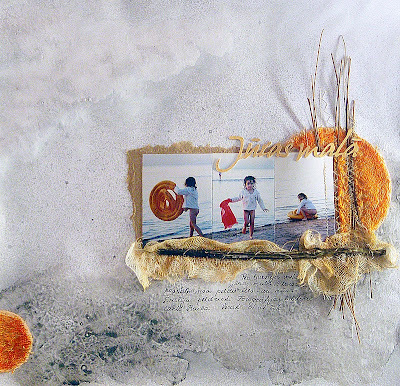 As we had to draw inspiration from given Color Combos Galore photo or use some sort of architectural, ledger, wood-grain or similar papers, I chose to opt for beach sand texture. First I blobbed lots of gesso on my white paper and let that dry. Then I made very diluted acrylic paint with white, black and little bit of sandy brownish color. I filled my mixture in a spry bottle and sprayed my page with it. 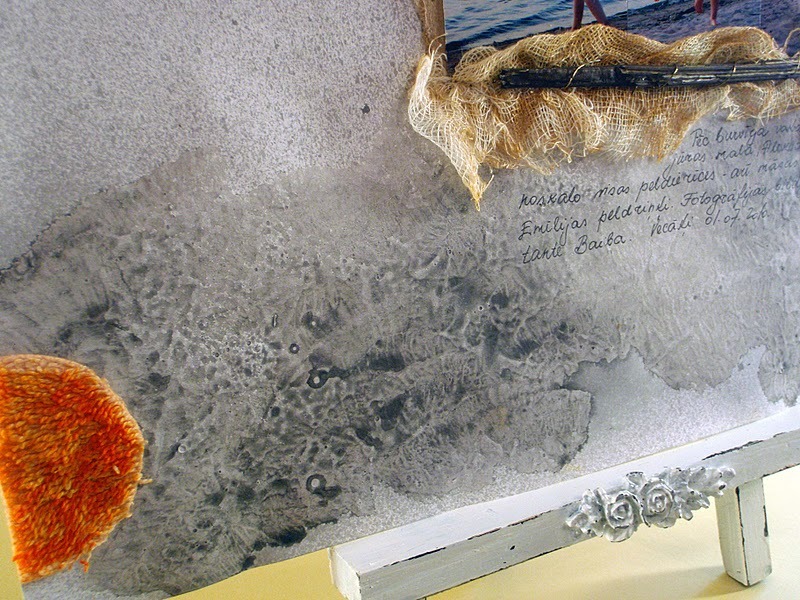 I think it looks quite realistic - like our grayish sand on beach. My grandmother told me to hang this on the wall, so I will wait until Aleksa is back from kindergarten and see what she has to say about that! I must say that this was the most hardest card to make using this Gurukitty image from CDAC Progressive Freebie Challenge, but I am quite satisfied with how it turned out. 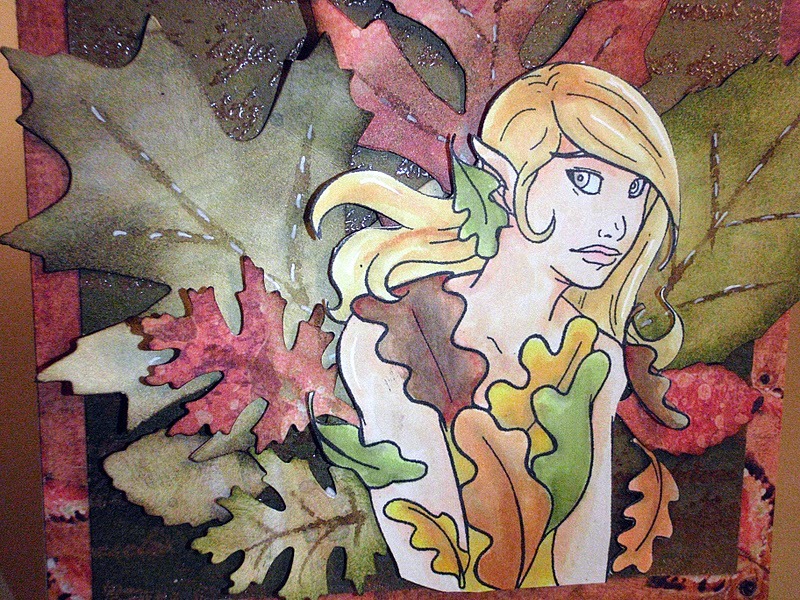 I colored it with ProMarkers and Distress inks. 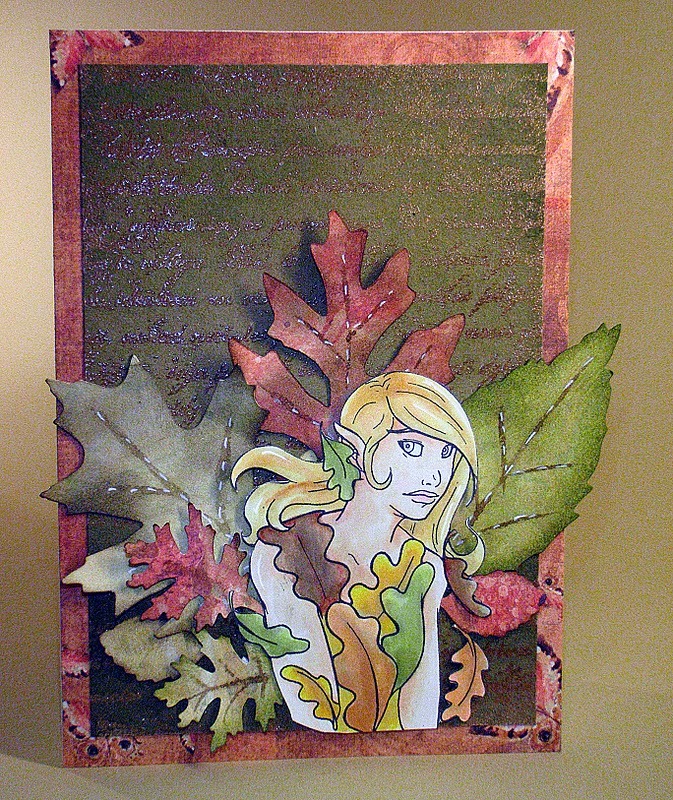 To continue the leaves theme, I used my new Sizzix Bigz leaves die and two leaves punches. I actually used just one K&Company double sided paper scrap - for my background panel and for leaves. Just used both sides of it and inked with various inks. 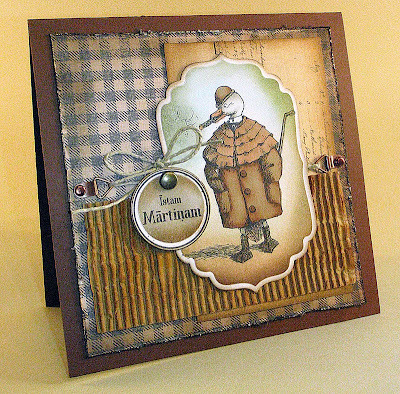 That brown panel is once again craft card embossed with clear embossing powder and text background stamp and then inked with brown inks. 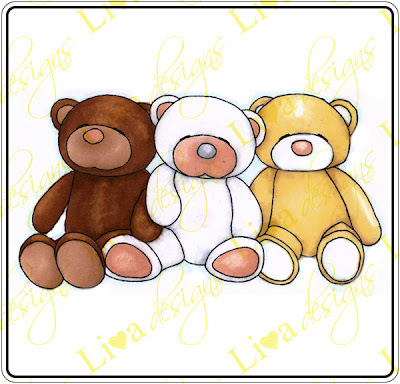 This next Just Inklined image from CDAC Progressive Freebie Challenges was so wonderful to color! I think that I also have a thing for sunflowers (as you van see in my sunflowers images) and butterflies. I wanted lots of dimensions on this card, so I printed this image twice and cut out butterfly and leaves and then used this dry embossing technique to give them dimension before adhering them with sticky foam. 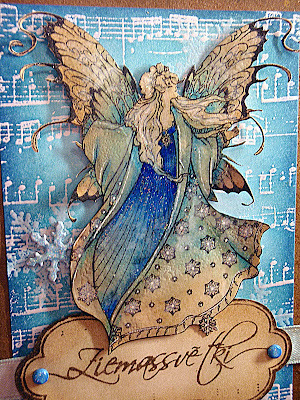 All I added to this card was two panels of Sizzix Bigz frame dies that I placed side to side under the focal image, and two jewel brads. This card was just a little sunshine in our gray Latvian autumn days. I'm soooooooooooo happy to finally be able to tell you all, that I have been chosen to become Digi Doodle Shop's Best challenges Design Teem member. 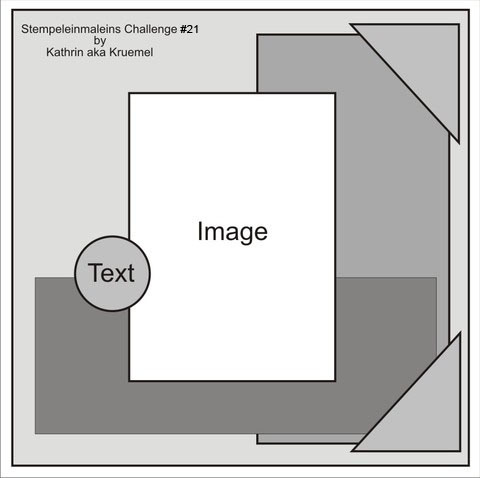 My first challenge as a DT member will be next week, so stop by their blog to see what's the challenge is going to be, but of course I will be posting all my works here as well. 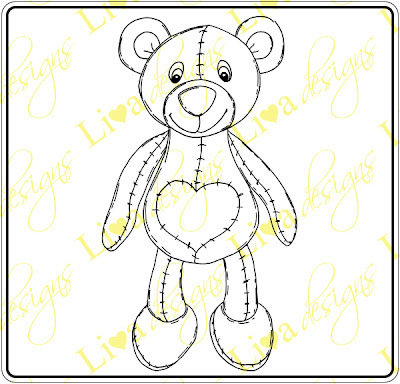 I just love Digi Doodle Shop images - they are so fun and detailed. It will be such fun to work with them. I really wanted to join Flutter By Wednesday's, Magical Mondays Christmas challenge and so that it all would be vintage. I went for the wintry fairy searching and found this lovely princess as a coloring page. She didn't have wings, so I added them and turned her into a fairy. I colored highlights with ProMarkers and Copics, then used Tumbled Glass and Faded Jeans Distress inks to add lighter shades of blue. Heavily misted everything with water and then added some white shading with watercolor pencil. 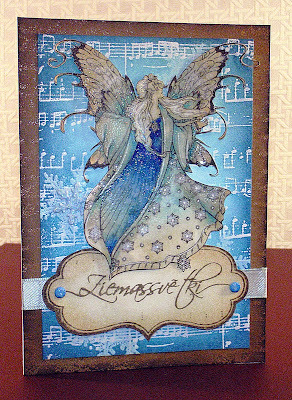 Then I used white mist technique, to apply white ink on some areas and snowflakes. 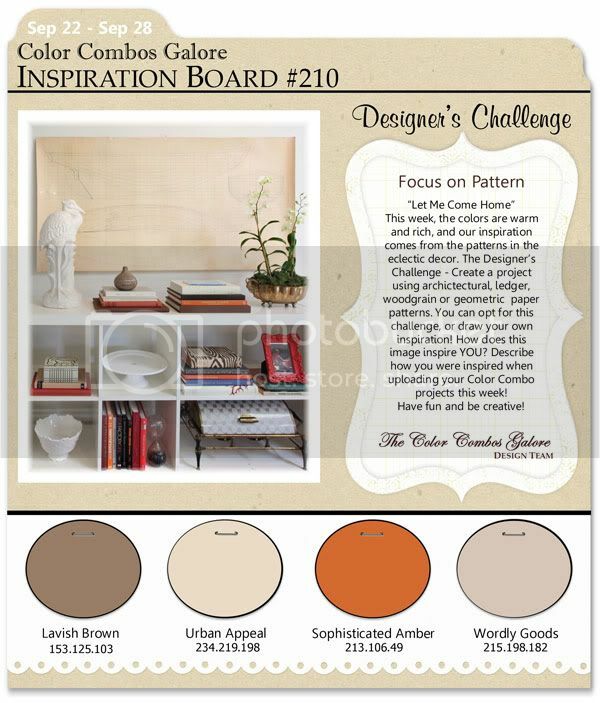 I learned this from makeitcolorful.com this weeks challenge. 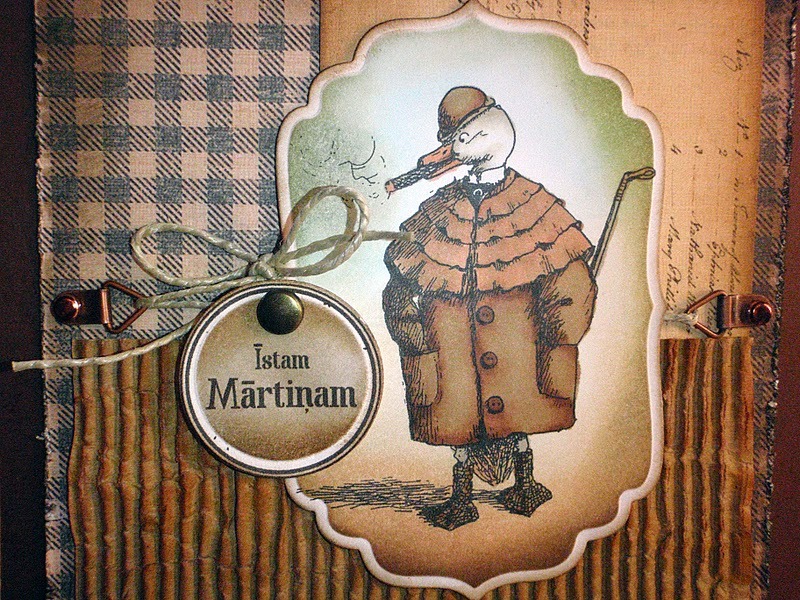 As this card had to be vintage, I inked it with Tea Dye and Old Paper inks. Lots of Stardust Stickles on some parts of her and white gelly pen dots on snowflake centers. I also fully clear embossed whole image to make it glossy. 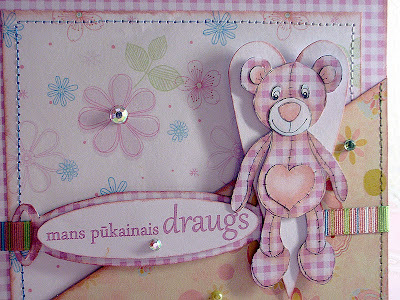 As for the backgrounds - for the first time, I used clear embossing resist. First I stamped and embossed craft card with old text background stamp and inked with Walnut stain and Vintage Photo inks. Next I embossed white card with music notes and inked it with Tumbled glass ink. Then after complete drying, I double embossed some snowflakes and inked again with Broken China and Faded Jeans inks. To one of the snowflakes, I added snowflake brad but colored it with markers and covered in stardust Stickles. White satin ribbon was little bit shaded with Broken China ink and placed under label stamp with sentiment saying Christmas. These were stamped with Walnut stain ink. Two more blue brads were also colored with markers and covered with glitter. So this is the third and last image in this month's CDAC Digital Drawing Challenge with a theme of 2 legs, 4 legs or both. 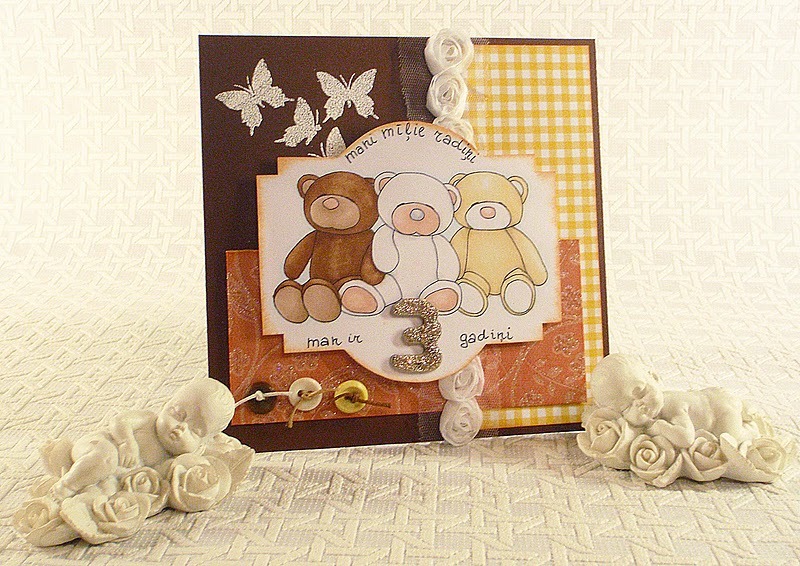 This stamp and full Cuddle Me Tight stamp set is in my Etsy shop. Today I found a very interesting exploding card/book on from cryons to Copics blog and just had to make one. This is how this book looks when it's closed. 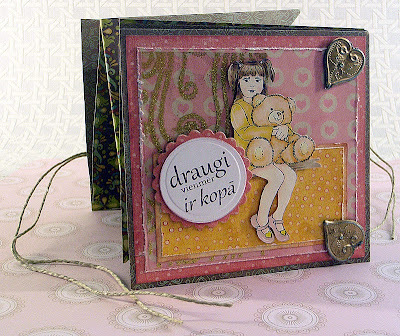 I used lots of K&Company papers, some very old acetate covered with gold glitter flourishes, metal heart charms and twine. I printed my own sentiment and cut it with Nesties. I made three pages, so it makes four squares where to put sentiments and photos or turn them into pockets to hold surprises. I can't believe that I made just two cards today - where does the time go??? Well hello today! As promised yesterday, here is my second beary image for the CDAC Digital Drawing Challenge with a theme of 2 legs, 4 legs or both. 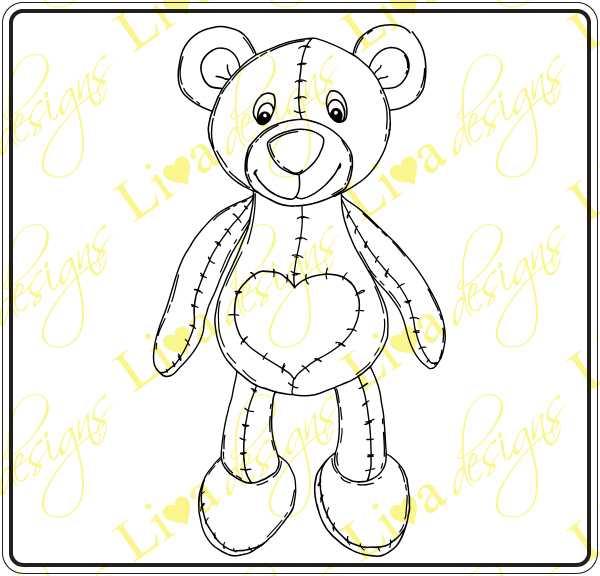 Love Teddy and complete Cuddle Me Tight set is already available in my Etsy Shop. This image associates to me with a soft fleece toy that a baby could take into a bed with him or someone could give it as a gift to someone special. So the card I made with it is also meant for someone special - a friend! 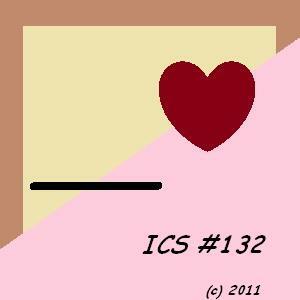 I used lots of pink papers, because SSDS challenges asks to use your favorite color - so pink it is. I actually managed to include some bits of light blue as this is my second favorite color :) That gingham paper is also my own and I like it so much that I decided to use it on teddy and ribbon slider as well. And lots of bling and pearls on flowers!!! Oh did I tell you that I left that sloped patterned paper as a pocket, so that I could tuck in some tickets or some treat to my dear friend? Meet "Shelf Buddies". 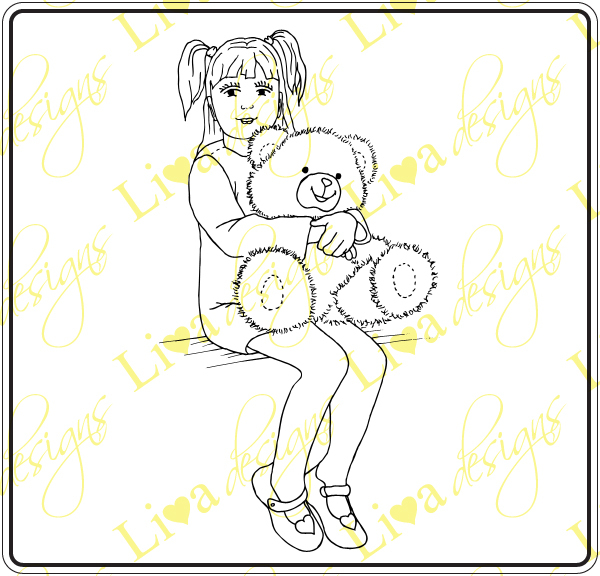 I had this idea of making a set with teddy bears for quite some time now - well since this month's CDAC Digital Drawing Challenge with a theme of 2 legs, 4 legs or both. This is just first image, but I have two more, which I will show you tomorrow. I also will include them in a set that will be available on my Etsy shop and it's going to be called "Cuddle Me Tight". 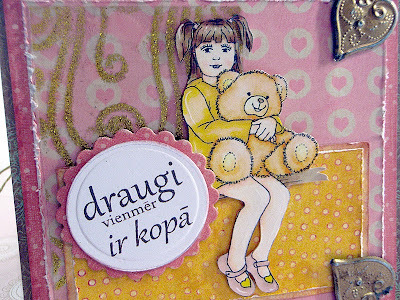 As I'm using my digital image and colored it with ProMarkers, I sure wanted to enter this lovely card in I Love ProMarkers and Passion For ProMarkers challenges. Thus the number on the card (3 for three bears) and a sketch from Passion For ProMarkers. 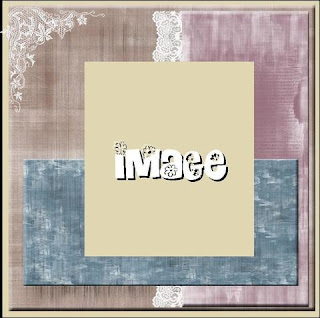 I must say that I first used this Sizzix Bigz frame die (just cut off the side ovals) and it fit my sentiment nicely. It actually is a children's rhyme saying "My dear relatives, I am 3 years old" - it does sound nice in Latvian and you may put any number in it. 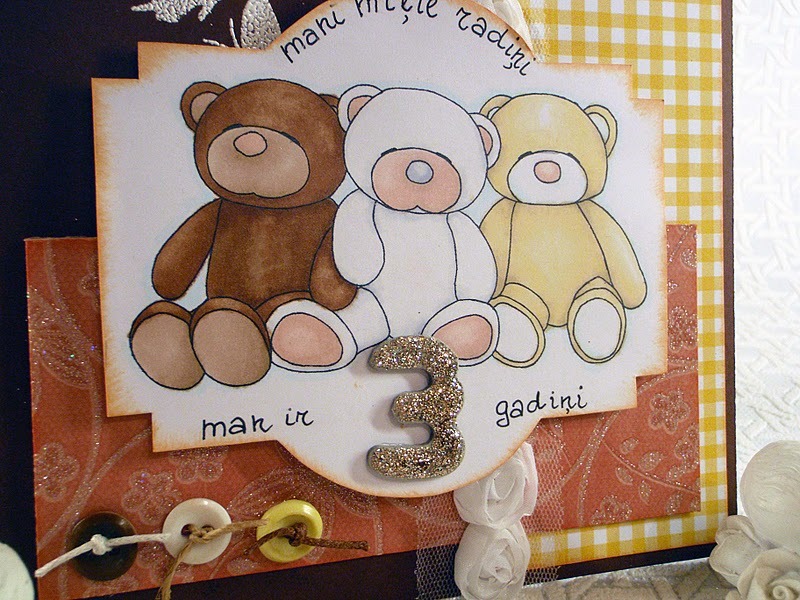 For the number I used letter m chipboard - just cut some parts off and covered with golden Stickles. 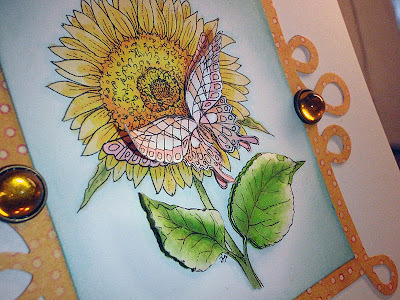 As the challenge on 2 Sisters Challenge Blog asks to use gingham or plaid, I used my own yellow gingham paper. I also added three buttons in matching colors to my bears, as this was asked in Dream Valley Challenges. For some lighter accents, I white embossed butterfly stamp and used white fabric rose trim. Come back tomorrow, as I will show you the rest of images I drew today - and maybe even more, if I will manage to make cards of those other images I finished today!